Fashion has found a place to raise money for a cause, Destination Fashion, and Bal Harbour Shops is its domain. This extravagant fundraiser was launched to to raise funds for The Buoniconti Fund to Cure Paralysis, the fundraising arm of The Miami Project to Cure Paralysis. The affair is a combination of fashion, shopping, philanthropic showcase and award ceremony and world class entertainment. For the first time in its history, Miami’s premiere luxury goods outpost, Bal Harbour Shops closed its doors to host this social fete. Only event attendees were able to gain access to the mall during the festivities. The luxurious venue with dedicated space to luxury brands like Harry Winston and others hosted Destination Fashion in the past with fashion presentations from Ralph Lauren, Michael Kors and musical performance by international singing superstar, Seal. This year one-of-a-kind affair had the affluent and the highly visible Bal Harbour community under gridlock with celebrity attendees and a fantasy and exotic destination transformation. The event attracted style makers, local celebrities such as Katrina Campins, fashion stars and philanthropic icons among others. The star studded celebration celebrity support included Las Vegas based singer and entertainer, Wayne Newton; music producer and song writer, Emilio Estefan; Gossip Girl actor, Matthew Settle; Professional Race Car Driver, Helio Castroneves; famed NBA Championship winner, Alonzo Mourning among others. Presented by Carnival Cruises CEO and owner of the NBA’s Miami Heat, Micky Arison and wife, Madeline Arison, the event exceeded its $3.9 million raised in 2009 with a staggering $31 million this year. A who is who of the Miami society graced the red carpet then proceeded to the beautifully decorated lawn for dinner, an award ceremony and fashion show. The evening began with an introduction from NBC News Special Correspondent, Tom Brokaw who served as master of ceremony. Co-chaired by Tommy Lee Jones and wife Dawn Jones, alongside International Polo sensation, Ignacio ‘Nacho’ Figueras and his wife Delfina Blaquier (photographer and former model). 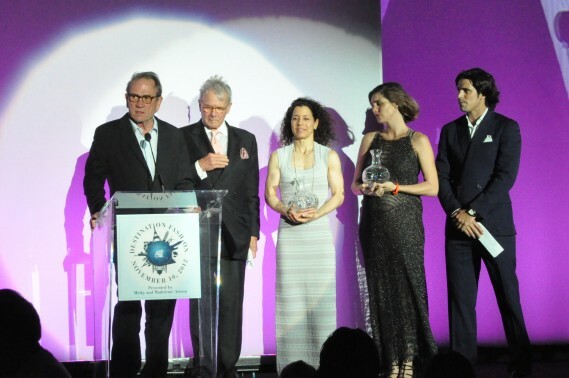 During the sit down dinner, the power crowd cheered as awards were presented honoring Micky and Madeleine Arison with an Inspiration Award; Philanthropic Award to Beatrice and Dr. Sandford Ziff, The Buoniconti Fund Award to Paul and Swanee Dimare; Champion for Cure Award to Edie Laquer Foundation while the Humanitarian Award went to Christine E. Lynn. Lynn, a longtime supporter stunned the crowd with a gift of $25 million that would go to build state-of-the-art spinal cord injury surgical suites, surgical intensive care units and rehabilitation center. The new tower, to be called the Christine E. Lynn Tower for The Miami Project to Cure Paralysis, will house surgical suites, an in-patient rehabilitation hospital and rehabilitation research entities that will enhance the Miami Project’s research efforts toward finding a cure for paralysis. The high profile fashion event has taken on a life of its own in Miami’s famed, fashion and shopping mecca. And there is nothing like this night of high fashion, high society in Miami. Cameras snapped, eyes and light beamed on the runway as 35 women of the 2012 Women of Substance and Style were saluted. Honorees included Olympic gold medalist, Dorothy Hamil and local philanthropist Yolanda Berkowitz. Each honoree was presented by a male celebrity presenter as they paraded the stage. Emilio Pucci’s designer, Peter Dundas covered the “Emilio Pucci‘s Spring 2013” fashion collection presented by Saks Fifth Avenue Bal Harbour . After dinner and the fashion presentation, the evening of brilliance continued later into the night as guests traveled through the exotic garden of Bal Harbour Shops sampling a decadent variety of desserts and libations. The garden was transformed with a creative and imaginative décor reflecting luxurious destinations from around the world—Africa, Rome, Paris. Inside the fashion pavilion guests experienced the Tiffany & Co. Blue Box Wall with their 200 iconic boxes filled with opportunities to bid on items from luxury brands like Alexander McQueen, Brioni, Ferragamo, Stella McCarthy, Bulgari and many more. The “Too Good to Keep Silent Auction” echoed designer luxury merchandises and first class accommodations with price tags valued up to $35,000. Bal Harbour shops have shown an overwhelming support to the one-of-a-kind affair to finding a cure for paralysis. Each store has donated special items for the ultra-luxe auction from Harry Winston women’s diamond piece valued at $34,000 and a luxury destination package with an exploration of the world of Breguet, to experience the history timepieces with a three night trip for two to Paris, complete with first class flight and luxury accommodations. The night wrapped up with a mini concert and performance from crowd pleaser and international Latin pop star, Enrique Iglesias. Proceeds from Destination Fashion 2012 will directly benefit The Buoniconti Fund to Cure Paralysis. The Miami Project is the world’s most comprehensive spinal cord injury research center located in the Lois Pope LIFE Center and is a designated Center of Excellence at the University of Miami’s Miller School of Medicine.